This was a trip for me so I am doing a report on it. Great people, mountains, laughs and food. What more could a person want? For me nothing. This was a great weekend to end the summer season with. Picked up AB in Kenniwick and headed to the social. We arrived at 11:30pm. Everybody was still up and hanging around the fire. After introductions and hanging out a bit we decided to set up the condo tent. It took a while in the dark after having too much to drink a swamp 6 inches from our set up spot. Yes I was up to my ankles in black stinky mud. We talked to CH Dean and wbs (Brad) and decided we would plan on being at the trail head around 7am. This was around 1am. Dean hit the sack and we hung out and socialized with the others till 3:30 - 4:00am . Next thing I know Dean is waking us at 7. My head was in the fog you know one of those heavy nasty fogs. Dean told us he was headed out and will meet us there. We got up as quick as we could and headed to the trail head. Brad, AB and I started up the trail just after 9:30 or so. Dean was not there so we figured he headed up and we would see him at some point. The trail heads up a ridge using countless numbers of switchbacks. The views of Rainier are around every corner. Around 3 miles AB was already having problems with her feet and boots. We stopped and she doctored the up a bit. 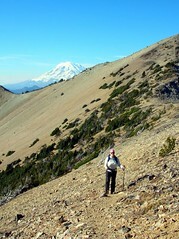 At around 4 miles at 7200' the trail comes to a intersection with the mount Aix trail and the Nelson ridge trail. Take a right and it takes you to Aix. Take a left and it takes you up Nelson ridge. This is a great area for a overnight backpack. Countless camp spot choices up on the ridge and one perfect one on the corner of the last switchback with great views of Rainier. 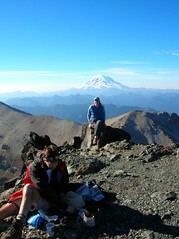 The trail then traverses along an open ridge and you have great views all around. oh yeah and more Rainier hehehe. Once we reached the saddle just below the summit ridge AB stayed back due to not enough time and her poor feet. 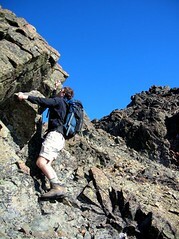 Brad and I picked the shortest most direct route up the west ridge. There is a scramble path all the way up to the top. Class 2 all the way with a few short sections of class 3 stuff. Lots of fun! 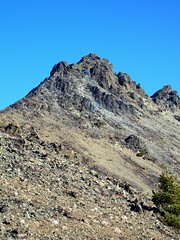 There is also a trail that is more of a hike/class two that traverses around to the East ridge to gain the summit. The summit 7766' is flat where an old lookout sat in the past. There are cables and remnants of the lookout all around the summit. 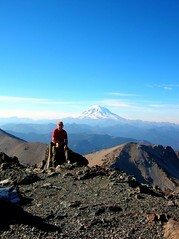 Great views of Rainier and surrounding mountains. We saw Dean down on the east side of the peak. He had already been to the top but came back up to hangout with us for a few. Sorry you had to wait for us Dean. We headed back down to the saddle to meet up with AB. can you find Dean and Brad? Poor AB and her feet. Descending was slow because her boots chewed up her feet. She needs to BURN those boots!!!! This was a fun little scramble. It was such a pleasure hiking with and getting to know Dean and Brad. Dean headed out to meet a friend for a hike the next day. Brad AB and I headed back to the social where the food was waiting. Got back to camp just after dark and everyone was there getting the grub on. Food was just great and tons of it! We all stuffed our faces and enjoyed the fire. Slug showed up a little later as a nice addition to the group. The next morning we had another breakfast feast and then all packed up and headed out. It was such a great pleasure to meet and hangout with all of you. I don’t think I have laughed and enjoyed myself like that in a long time. Thank-you, all of you. MG and Damian it was great spot you guys picked and set up for this THANKS. What a great group of people this forum has on it! I had a blast.